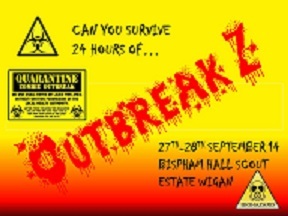 South Ribble Scouts » Blog Archive » Outbreak Z… Can you survive the zombie attack click here to find out how! Outbreak Z… Can you survive the zombie attack click here to find out how! A 24 Hour Survival camp and competition based on teams of Explorer Scouts surviving a Zombie Outbreak , they have to find and extract the cure in competition with other teams from all over the county. All the Information you need here!